January and February are super high calorific months in my household. It’s birthday season for four fifths of my family, and so far I’ve already baked four cakes in less than a month. Everyone has a different request and I try to oblige them all. 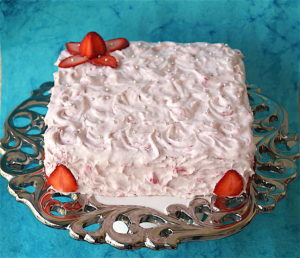 I’ve baked a chocolate cake, a tutti frutti cake, a strawberry vanilla cake and this full on strawberry cake. There’s one more coming up in a couple of days and then I will TRY to take a bit of a breather from these high sugar high calorie but oh so yummy treats. I will try!! As you may know from my previous posts, I try to keep the sugar and butter down to the bare minimum, so this is a no-butter, no-oil cake and it has only enough sugar to make it palatable. 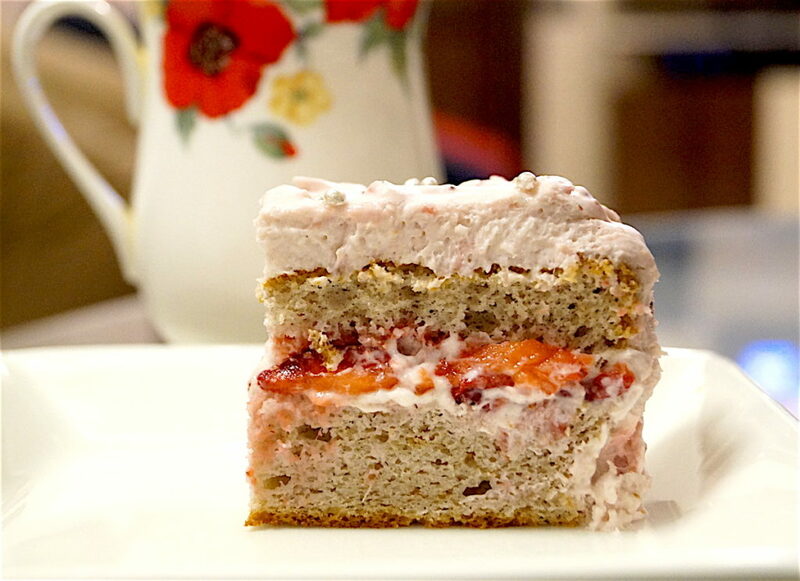 The icing has only white chocolate, strawberry compote and cream and no added sugar and there’s just one tablespoon of sugar in the strawberry filling. There are strawberries everywhere and for those who love strawberries and anything to do with them, this is the cake for you. You can even omit the icing all over the cake if you wish and just keep the centre filling with just strawberry slices and whipped cream if you do not want a rich cake. This cake will surely get you many appreciative compliments and I hope you will take the trouble to make it. You’re going to need a lot of strawberries for it but hey, It’s well worth the (not so much) effort. Put the sliced strawberries and the sugar in a heavy bottomed pan and boil on low heat for about 2 minutes till the sugar has melted and the strawberries are slightly soft. 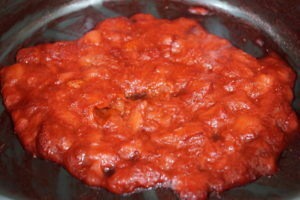 Remove from pan into a bowl and set aside. 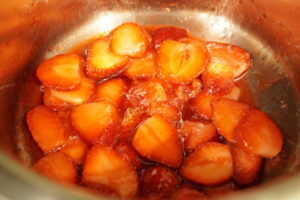 In the same heavy bottomed pan used for the strawberry filling (do not bother to wash) place the diced strawberries and boil down till most of the moisture has evaporated and it becomes more like a thick chunky compote. Remove and set aside. Crush the white chocolate into smaller shards and melt in the microwave for two minutes. Remove and check if the chocolate has melted completely. If not, put it in for a minute more. Once the chocolate has melted, stir it well and keep aside. 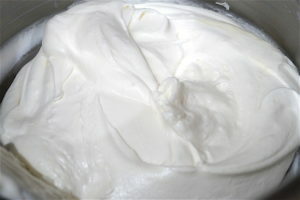 Beat the heavy cream with an egg beater till its nice and fluffy. Then add the melted chocolate to it and fold nicely. Add the strawberry compote to it and fold till well incorporated. Your icing is ready. After you’ve added some icing to the middle of the cake, whisk the rest of it for about 30 seconds to get a nice pink colour and slightly firmer icing so that it does not run down the cake. Line the bottom of a 9 X 9 inch square pan with butter paper or parchment paper and oil the sides of the pan. Preheat the oven to 180°C with only the bottom heating rods on. Sift the flour in a fine mesh sieve into a bowl or plate. Add the salt and baking powder to the flour and set aside. 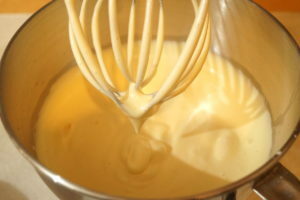 Crack the eggs in a mixing bowl or in the bowl of your stand mixer and beat on high speed till they are slightly fluffy. About 30 seconds. 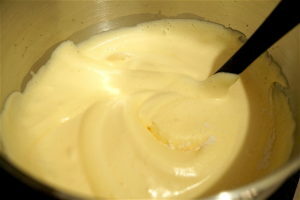 Then add the cup of sugar to the eggs and beat on high speed (stand mixer speed 8) for a minute and a half till the mixture has quadrupled in size and becomes slightly thick. 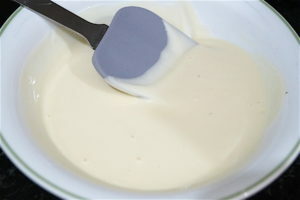 The mixing blades should make well defined grooves on the batter and it should form stiff peaks. If the mixture is still pouring down from the mixer blades then beat for another 10 to 15 seconds on high till the stiff peaks form. 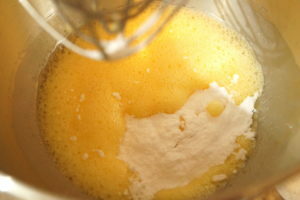 Fold the flour gently into the beaten egg mixture in two parts making sure it’s all incorporated. 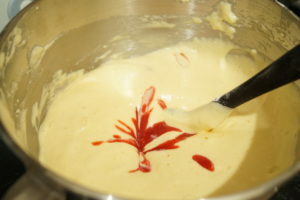 Then add the strawberry puree to the mixture and fold till fully incorporated. 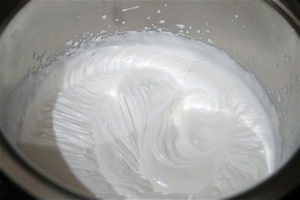 Lastly, fold the two tablespoons of hot water into the batter and pour it into the baking tin. Bake in the middle rack of the oven for 50 minutes. Then insert a skewer into the middle of the cake and if the skewer comes out clean, remove the cake from the oven. if the skewer has even a little batter stuck to it, keep the cake in the oven for another five minutes and test again. Remove only when the skewer comes out clean. If, when you take the cake out of the oven the cake starts sinking in the middle, turn the baking tin upside down and keep it atop a cake rack till the cake cools. The part that’s sinking will come right back up! This would mean that you use a baking tin thats slightly larger so that the cake – which tends to rise quite a bit – does not come above the sides of the pan (a 9 x 9 square tin is perfect for this. Please do not use a non-stick baking tin for this cake. After the cake has cooled completely, run a knife very straight and carefully along the edge of the cake to loosen it from the sides of the pan and turn it upside down on to a plate. Remove the butter paper lining from the bottom of the cake and place the cake straight side up on to a serving dish. Cut the cake in half, set aside the top part and add a layer of the chocolate icing to the lower half of the cake. 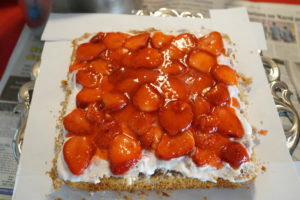 Then add the sliced strawberry compote all over the top of the icing. Place the top part of the cake back over the bottom half of the cake. 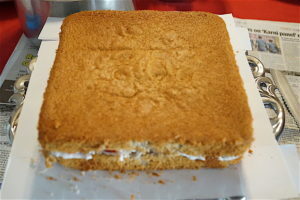 Then using your knife, cover the cake on all sides and the top with a thin layer of icing. 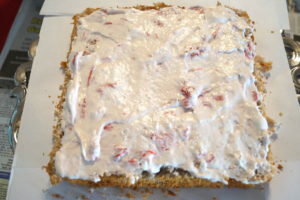 This is called a crumb coat, because it catches all the crumbs making them stick to the cake so that it does not come all over the outer icing. Then nicely coat the whole cake with the rest of the icing and make any decoration you wish. I made swirls with my knife. Enjoy this lovely light cake. Do not use a smaller baking tin where the cake can rise over the top. 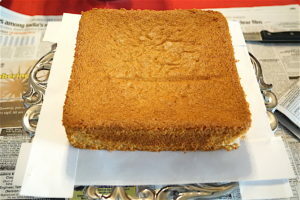 This cake rises a lot so stick to a minimum 9 inch diameter tin or a 9 x 9 square tin because you may need to cool the cake upside down to prevent it from sinking in the middle. For that reason also do NOT use a non-stick pan as the cake will slide out. 2. Whisk on high speed for about 30 seconds till you get this. 3. 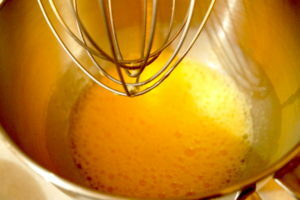 Add the sugar and whisk on low speed for 10 seconds. 4. 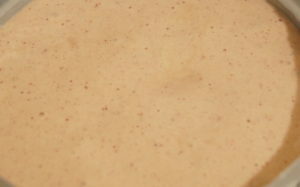 Increase the speed to high and whisk for a minute and a half till you get to this texture. 5. 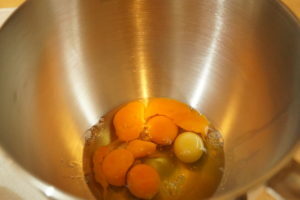 Fold the flour mixture into the beaten eggs gently in two batches. 7. Pour into the baking tin and bake at 180°C for 50 minutes. 8. Once the cake is cooled, remove from tin. 9. 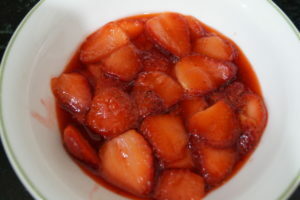 For the filling on low heat boil thickly sliced strawberries in 1 tbsp of sugar. 10. Till it reaches this stage. 11. Pour i to a bowl and set aside. 12. Whip cream to this stage. 13. Melt the white chocolate. 14. Fold the slightly cooled chocolate into the cream. 15. 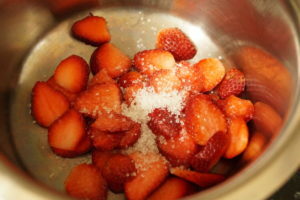 Take the roughly diced strawberries and boil down to this stage. 16. 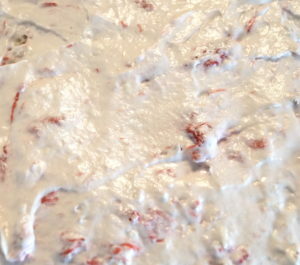 Add the strawberry compote to the cream and chocolate icing and mix well. 17. 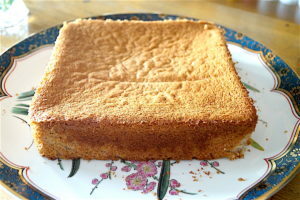 Set the cake on a serving dish and slice it in half horizontally from the middle. 18. Add a bit of the chocolate icing. 19. Top that with the strawberry slices. 20. Put the top back on. 21. 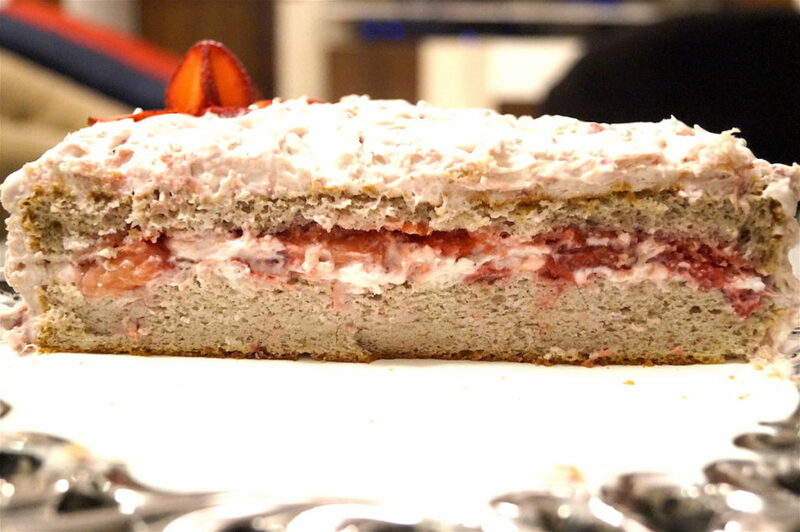 Thinly coat the cake with icing to catch the crumbs. 22. 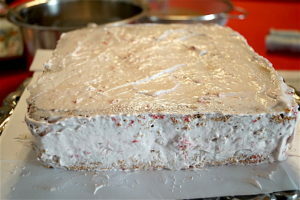 Cover the thin layer of icing with the rest of the icing and decorate as you wish.